Sustainable development and poverty eradication may be the main topics Brazil will propose to discuss during the United Nations Conference on Sustainable Development (Rio+20). Rio+20, also known as the 2012 Rio Earth Summit, is slated to open in June next year. Brazil's National Commission for Rio+20 is co-chaired by Environment Minister Izabella Teixeira and Foreign Minister Antonio Patriota. After the meeting, Teixeira told local press that they will "work on issues that Brazil wants to develop in the context of poverty eradication, green economy and arrangement of additional governance and sustainable development." Agencia Brasil, Brazil's official news agency, said the group will further discuss with government agencies and civil society issues to be addressed at Rio+20 and will present their proposals to the United Nations in November. 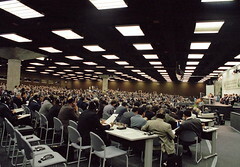 The 2012 Rio Earth Summit will mark the 20th anniversary of the founding of the United Nations Conference on Environment and Development (UNCED).